People with age-related macular degeneration (AMD) in Bradford, West Yorkshire, can now get at check-up at the new Bradford Macular Centre. Both the Bradford Teaching Hospital NHS Foundation Trust (BTHFT) and Bayer created this centre help address the rising number of AMD patients in the UK. The major machine that will be used at this new center is an optical coherence tomography device. Ophthalmologists believe this incredible device will help AMD patients monitor their symptoms and better diagnose people with retinal issues. Bayer paid for this device to be in the new centre. Due to an aging population, the rate of people in the UK with AMD has been rising steadily in recent years. In particular, eye doctors note that cases of the more severe wet AMD have grown in modern times. As you could imagine, the rise in the AMD patients has put a huge strain on NHS services. Helen Devonport, an NHS eye surgeon, told journalists she believes this new centre will help eye doctors take care of AMD patients in a more timely fashion. Devonport went on to say, "The number of patients that we can see per clinic has increased so we have more than doubled the capacity." This will, of course, help patients avoid developing symptoms of blindness from AMD. Jackie Napier, Bayer's medical director for ophthalmology, said she was glad Bayer could help improve the quality of care for thousands UK residents. In relation to her partnership with the BTHFT, Dr. Napier said, "We need to continue to work together as an ophthalmology community to overcome challenges in service delivery so we can preserve patients' sight as much as possible." Wet AMD is caused by overgrown blood vessels that leak blood behind the retina. Although less common, wet AMD is far more severe than dry AMD. Many people with wet AMD have to see an eye doctor for eye injections weekly. 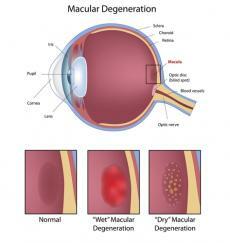 Affecting 9 out of every 10 AMD patients, dry AMD is caused by retinal deterioration. Dry AMD can be managed with a change in nutrition, blood vessel growth inhibitors, and/or laser surgery. Bayer AG is a multinational pharmaceutical company headquartered in Leverkusen, Germany. Although Bayer has been around since 1823 and has done so much great work across the globe, Bayer is still best known for its pain-killing drug aspirin. Recent statistics show that 1 in 10 people over the age of 65 have some form of AMD in the UK. Researchers believe about 700,000 UK residents will have AMD by 2020, which makes it the leading cause of blindness in the nation. Caucasian and Chinese people are at a greater risk of developing AMD later in life. Also, women are far more likely to get AMD than men. Since visual symptoms don't appear till the disease has advanced a great deal, ophthalmologists recommend everyone over the age of 40 get a regular eye screening. Anyone who wants more information on this centre can contact Bayer's UK office at 400 South Oak Way, Green Park, Reading Berkshire RG2 6AD or check out their social media pages on Facebook, Twitter, and YouTube.